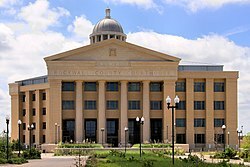 Rockwall County is a county in the U.S. state of Texas. At 149 square miles, Rockwall County has the smallest area of any Texas county. As of the 2014 U.S. census estimate, its population was 87,809. Its county seat is Rockwall. The county and city are named for a wall-like subterranean rock formation that runs throughout the county. Rockwall County is part of the Dallas-Fort Worth-Arlington, TX Metropolitan Statistical Area. It was one of the top 25 fastest-growing counties in the U.S. in 2010. Rockwall County is listed as the 6th wealthiest county in Texas. Cities in Rockwall county include Rockwall, Royse City, Fate, McClendon-Chisolm, Mobile City, and part of Rowlett. Rockwall County was formed in 1873 from portions of Kaufman County. It split off because access to the county seat of Kaufman was inconvenient. It was named for its county seat, Rockwall. According to the U.S. Census Bureau, the county has an area of 149 square miles (390 km2), of which 127 square miles (330 km2) is land and 22 square miles (57 km2) (15%) is water. 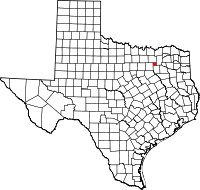 It is the smallest county by area in Texas. As of the census of 2000, there were 43,080 people, 14,530 households, and 11,972 families residing in the county. The population density was 334 people per square mile (129/km²). There were 15,351 housing units at an average density of 119 per square mile (46/km²). The racial makeup of the county was 89.17% White, 3.24% Black or African American, 0.40% Native American, 1.32% Asian, 0.05% Pacific Islander, 4.45% from other races, and 1.37% from two or more races. 11.07% of the population were Hispanic or Latino of any race. There were 14,530 households out of which 44.40% had children under the age of 18 living with them, 71.00% were married couples living together, 8.00% had a female householder with no husband present, and 17.60% were non-families. 14.40% of all households were made up of individuals and 4.40% had someone living alone who was 65 years of age or older. The average household size was 2.92 and the average family size was 3.23. In the county, the population was spread out with 30.10% under the age of 18, 7.00% from 18 to 24, 31.10% from 25 to 44, 23.30% from 45 to 64, and 8.60% who were 65 years of age or older. The median age was 35 years. For every 100 females, there were 100.80 males. For every 100 females age 18 and over, there were 96.90 males. The median income for a household in the county was $65,164, and the median income for a family was $71,448 (these figures had risen to $75,915 and $82,150 respectively as of a 2007 estimate). Males had a median income of $49,636 versus $32,410 for females. The per capita income for the county was $28,573. About 3.80% of families and 4.70% of the population were below the poverty line, including 5.60% of those under age 18 and 4.10% of those age 65 or over. Rockwall County was ranked the sixth fastest-growing county in the nation by the US Census Bureau from 2000 to 2010, adding 35,257 people (an 81.8% change). Prior to 1972, Rockwall County was a Democratic Party stronghold at the presidential level The 1968 election was highly transitional for the county with Hubert Humphrey only winning with 39% of the vote thanks to the strong third-party candidacy of George Wallace. From 1972 on, the county has become a Republican Party stronghold in presidential elections. George H.W. Bush in 1992 being the only Republican to fail to win a majority in the county since then. as the strong third-party candidacy of Ross Perot that year led him to a second-place finish in the county over national winner Bill Clinton. However, the county was represented in Congress by a conservative Democrat as late as January 2004, when Representative & Rockwall resident Ralph Hall, switched parties to the Republican Party. ^ "Population of Texas Cities and Towns Sorted by County". The County Information Project Texas Association of Counties. Retrieved 16 March 2015.